Port Blair, Dec 11: “Panchayati Raj Institutions are the backbone of the Islands and the roots of democracy. 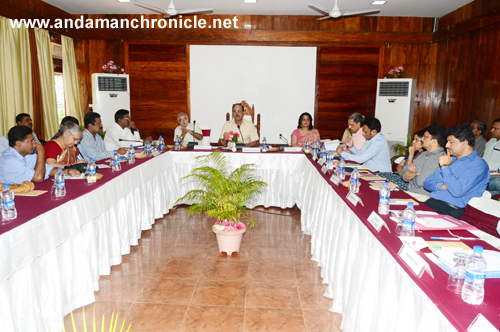 Hence, it is imperative that we strengthen them and also improve their functioning so that they contribute to the economic development and prosperity of these Islands”, said Lt Gen (Retd) A K Singh, the Lt Governor, A & N Islands while addressing the members of the three-tier Panchayati Raj Institution of North and Middle Andaman at a meeting held in the conference hall of the Megapode Resort here today. The meeting on ‘rural development and Panchayati Raj programmes’, was the first of its kind to be held in these Islands. It was also the first in a series of consultations with PRI representatives, and a key aspect of the development and devolution strategy as envisioned by the Lt Governor in his Independence Day speech. The Lt. Governor further said that all out effort will be made to further strengthen and uplift the Panchayati Raj system in these Islands so that its fruits of development reach the rural poor. “Efforts will have to be made to redress the shortcomings in the functioning of the Panchayati Raj System”, the Lt. Governor added. At the outset, the Secretary RD/Panchayat, Shri N.K. Sharma, welcomed the Lt Governor and all invitees to the meeting. He made a power point presentation about the functioning of PRIs and the schemes being executed by PRIs of N&M Andaman. Critical issues affecting the PRIs such as devolution of powers, allocation of funds, avoiding the duplication of work, strengthening of Engineering Wing of ZP, N&M and filling of vacant posts in all three-tiers on priority, were taken up for discussion. Giving his observations on the issue, the Lt. Governor asked the Chief Secretary to constitute separate committees, comprising of Secretaries and representatives of PRIs, to study each of the issues and come up with practical solutions in a time bound manner. The Lt. Governor also urged the PRIs to resolve the audit issues on priority to avoid adverse audit paras subsequently. The Lt. Governor directed all PRI functionaries to maintain display boards, giving clear information about the developmental works underway. “Transparency and propriety must be maintained at all costs”, the Lt. Governor said. In order to increase efficiency of the PRI functionaries, the Lt. Governor directed that four training programmes will be organised for PRI members and two programmes for the newly inducted Panchayat Secretaries every year. The Adhyaksh, Zilla Parishad, N&M Andaman, Shri K. Srinivasan, Up-Adhyaksh, Shri Sony Thomas, other PRI members from North & Middle Andaman District actively participated in the discussions giving valuable suggestions. The Adhyaksh thanked the Lt. Governor for taking this very important step which will help and motivate the PRIs further. The Chief Secretary, Shri Anand Prakash and senior officers of the Administration were also present.